Summary: Adam Mitzner’s critically acclaimed legal thrillers have “more loops and flips than Coney Island’s Cyclone” (Kirkus Reviews) and “more twists than a California cloverleaf interchange” (Bookreporter). His latest, a captivating examination of justice and ethics, will leave you guessing until the last page. I reviewed Adam Mitzner’s first novel, CONFLICT OF INTEREST in 2011, and looked forward to reading his latest, LOSING FAITH. Mitzner did not disappoint. The main character is defense attorney, Aaron Littmann, the highly regarded chairman of a top New York law firm. Littmann, although happily married, carried out an affair with federal judge, Faith Nichols, while trying a case in her court. A big no-no. Judge Nichols is now a leading candidate for a Supreme Court nomination as long as the trial she’s presiding over results in a guilty verdict against Nicholi Garkov, a ruthless Russian terrorist and the most hated man in America. Since Garkov waived his right to a jury, Judge Nichols will decide his fate. Garkov learns of Littmann’s affair with Nichols and blackmails Littmann to act as his attorney with the proviso that Littmann convince Judge Nichols to find him innocent. If not, he will reveal the affair and ruin both their careers. When Judge Nichols is found dead in Central Park, Littmann is accused of her murder and must stand trial. Although he is innocent, the facts in the case weigh heavily against an acquittal. Littmann is being defended by colleague and close friend Sam Rosenthal who reminds him that trials are about winning and not necessarily about truth. Lying may be the only way to win an acquittal and save his career and marriage. Mitzner uses many of the same techniques he used in his first novel to maintain reader interest such as court scenes that are very realistic as defense and prosecution counsel continually position for advantages with the presiding judge and a good look into client-attorney relationships outside the courtroom. The fact that Mitzner is a practicing defense attorney adds reality to the legal action he describes. In addition to Littmann, Garkov and Rosenthal, the other main characters are Judge Nichols, Littman’s wife, Cynthia and Rachel London, a partner in Littmann’s law firm. It’s kind of a strange coincidence that these three women are extremely successful, beautiful and each have an attraction to Littman. As with his first novel, Mitzner develops complex characters with their own problems and agendas. LOSING FAITH is a fast paced legal thriller without the chase scenes and gore presented in most thrillers. The storyline contains plenty of twists and turns and has a truly surprise ending. 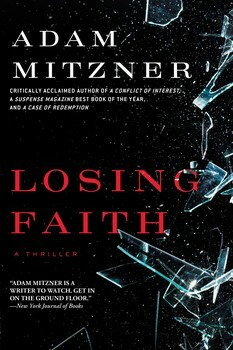 If you are a fan of legal thrillers or like Adam Mitzner’s prior novels, you’ll enjoy LOSING FAITH. I love fast paced legal thrillers but don't read them as often as I used to. This sounds so good to me!